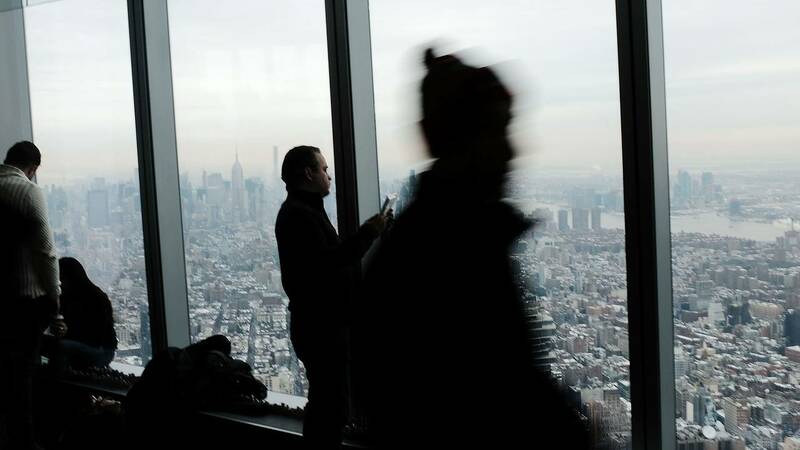 Visitors to One World Observatory look out at a snow-covered Manhattan on Jan. 8, 2018, in New York City. (CNN) - On Friday, Cleveland residents enjoyed a balmy day with a high of 60 degrees. Just 24 hours later, the temperature sat at a frigid 18 degrees. The Ohio city was among several in the Midwest, Southeast and Northeast that saw sharply plunging temperatures followed by freezing rain, sleet and snow on Friday night and into Saturday. Nearly 17 million people, in places from northern Pennsylvania to Maine, remained under winter storm warnings or winter weather advisories late Saturday morning -- about half the number affected earlier in the day. A cold front caused dramatic temperature drops of 40 to 50 degrees in many cities in the storm's path, CNN meteorologist Allison Chinchar said. From Friday to Saturday, temperatures in Nashville plummeted from 62 to 29 degrees; in Washington, from 64 to 32 degrees; and in Buffalo, New York, from 60 to 11 degrees, she said. NBA star LeBron James had his own way of describing the frigid cold in Cleveland: "Burrrrrr!!!" "Man just landed back in Cleveland and I have to say in the 29 years I've lived here this is the coldest I've felt it!" James said on Twitter. Temperatures in the Northeast will drop further as the cold front pushes east. The cold front was easily visible in a map posted around 10 a.m. ET by the National Weather Service of Burlington, Vermont. Temperatures everywhere west of the front line were near freezing or below. Meantime, areas to the east, including Massachusetts' Cape Cod, still were unseasonably warm, though officials warned: "That will be short-lived." The greatest threat for ice accumulations will be in New Hampshire and into Maine this morning, with up to a 10th of an inch of ice possible, CNN meteorologist Haley Brink said. And frigid temperatures are expected to stick around through the beginning of next week. The elements could provide some added intrigue to this weekend's NFL postseason games, as the New England Patriots, Philadelphia Eagles and Pittsburgh Steelers are set to host games in outdoor stadiums. More than 15 million people in the Northeast remain under a flood watch through Saturday because of ice jam flooding along rivers. The Burlington weather office posted a remarkable video of an ice jam on the Ausable River in northern New York. The Ohio River at Pittsburgh is also under a river flood warning, the weather service said. The river was at 24.77 feet as of Saturday morning and was expected to rise above the flood stage of 25 feet. The Ohio River will then crest at around 25.5 feet this afternoon and begin to fall back below the flood stage tonight, the meteorologists said. In Buffalo, Mayor Byron Brown said about 100 homes had been affected by flooding, according to CNN affiliate WIVB.